Surface Magazine described Twiga Mbunda's jewelry designs as having "a purity of form that manages to be simultaneously archaic and futuristic". Sound fabulous? We think so! Mbunda started her career in Tanzania as a civil engineer and then moved to the US in 1985. 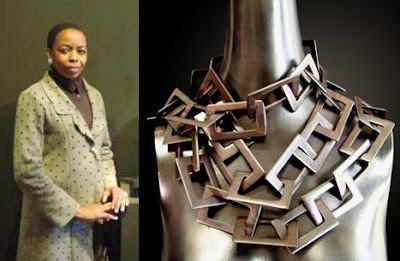 Unable to use her engineering degree, she started a new career as a Tribal Art Dealer in San Francisco in 1987 with her showroom, Twiga Gallery. Mbunda's interest in art soon evolved into jewelry design and today she now has jewelry in many stores, has been featured in many magazines, and has adorned many celebrities. In 2007, Mbunda started the Mbinga Children's Organization to support the children of East Africa and to build an elementary school for girls where the daughters of AIDS victims can obtain the same quality of education that she received. Mbunda was the first person ever to leave her village so she hopes that her successful business and charity efforts will inspire others to also explore the world and their own possibilities.